Latex Half Body With Head And Hanging Eyeball This gruesome prop features a foam-filled latex half-torso with a severed head and a hanging eyeball. Has realistic coloring and texture. Measures approximately 28" wide x 24" high. Well With Skull And Fog Circular Latex Skull Well is approximately 9" high x 21" wide. Add water to create fog. Includes UL Listed AC adapter (cord is approximately 5.5' long). Life-sized Cloaked Grim Reaper Our imposing Life-sized Cloaked Grim Reaper bids grim Halloween greetings to all who cross his path. Invite this spooky figure to keep watch over your next frightful gathering. Authentic fabric cloak conceals an eerily realistic skeleton. Two-piece construction. Designed to last for years to come — perfect as a staple for annual Halloween parties. 5-1/2'H. "30"" Out of the Ground Skeleton" This 30" Out of the Ground Skeleton is made of latex, has posable arms and measures approximately 31.5" high x 20" wide (shoulder width can extend to 42" wide). Zombie Prop on Stake Zombie is wearing a gray tattered shirt with ripped black pants and a black filmy web all over his body. Head has long white hair and vile face. Zombie is made of plastic and fabric and measures approximately 48" high x 18" wide. Air Wavers Ghost Look at this ghost go! Be the first on your block to have a twelve foot tall illuminated ghost that waves his arms in your front yard! This 12 foot Air-O-Motion inflatable includes a flapping arm ghost attached to tombstones, lights, 3 base anchor stakes, 2 big base anchor stakes, 3 plastic tether stakes, and 3 tether cords. No assembly require, inflates in just seconds! Decoration is waterproof, and intended for both indoor & outdoor use. A great party or Halloween decoration! Collapsible Rotten Coffin with Fiend Kit Collapsible rotten coffin with fiend kit includes coffin that measures 60" high and a realistic looking 5' skeleton. Cemetary Gate Way Includes 35 Metal Gate Way pieces with fasteners, plastic sign with chain that says "Cemetary", spider Webbing, spider and assembly instructions which stands approximately 7"9" x 4'8" when fully assembled. Reaper Group (3 count) Includes (3) skeleton heads that each have a piece of fabric over the head with an attached plastic post and 3 lawn stakes that when assembled measures approxiamately 21" tall. Welcome But Beware Fence Post (2 count) Comes with 2 posts with carvings that are made of plastic that measure approximately 2.4' high and chains that measure 16" long. 3' x 6' Spooky Fence with Ghoul Heads This retractable Spooky Fence is made of wood and stands approximately 3' high and stretches to 6' wide. Fence also has 6 foam skeleton ghoul heads on the top. Lighted Groundbreaker Skeleton Body Parts A spooky decoration for your yard. Vinyl skull with spider on top. Can be activated with push button or motion. When activated strobe on inside flashes and gives an eerie effect. Operates on 2 - AA batteries, (NOT included). Six inches tall, 4.5 inches wide and 5.5 inches deep. Pirate Ground Breaker The Pirate Ground Breaker decoration measures approximately 21" tall with 10" ground stake. Pirate is wearing a vest and bandana and an eye patch. Eerie Acres Cemetery Lawn Sign Eerie Acres Cemetery Lawn Sign is weathered green and gray is made of molded plastic and metal and measures approximately 27.5" wide x 20" high (not including metal stakes). Sign says "Eerie Acres Cemetery Est. October 31, 1899". Stakes are included and measure approximately 10"" high. Haunted Valley Cemetery Lawn Sign Haunted Valley Cemetery Lawn Sign is green with white lettering that says "Haunted Valley Cemetery, Come and Stay a While..." Lawn sign is made of metal and plastic and measures approximately 24" wide x 18.5" high. Stakes are included and measure approximately 10" high. Color Change Enter If You Dare Sign Requires 3 -AA batteries (not included). Please Note: due to a misprint by the manufacturer, the box states that this product requires 2 batteries, but it actually requires 3 batteries to operate. 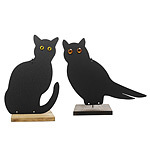 hooty owl and scaredy cat garden stakes Pesky critters rummaging through your garden? Pigeons loitering on your ledge? Or birds bumping into your windows? These silent yet effective guardians will stand as deterrents to an array of creatures. Place them wherever needed - stick them in the ground with the included stake, nail them to a fence or hang them from a tree. They can also make great Halloween decorations. Powder coated steel with a durable outdoor weather finish, they can be displayed outdoors year round. Made in Maine. The life-size Scaredy Cat and Hooty Owl are sold individually. Enter At Your Own Risk Door Flag Transform your home into the scariest house on the block with our new Enter At Your Own Risk Door Flag, sure to be a scary sight for trick or treaters this Halloween season! Polyester flag is water repellent and UV resistant and comes complete with two door hangers for easy hanging. We custom personalize your family name in black flock letters for a look to call your own! Halloween Sign Post Our Halloween Sign Post shows the way to 3 popular Halloween haunts, but not the way out. Repositionable signs ensure your yard is on the main path to spooky destinations. ROTATING HEAD OWL Owl head moves in direction of the wind to scare pests! When critters come close, this life-like owl swivels his head in their direction. A great way to keep your patio, garden or rooftop free from squirrels, rabbits, birds, and more without using chemicals. NASA used it to scare woodpeckers from the shuttle! Resin, 8 x 7 x 16". Halloween Ultimate Outdoor Decorating Set Ultimate Halloween Outdoor Set includes: (1) Halloween Fringe Banner that measures approximately 20' wide and says "Happy Halloween" with ghosts, spiders and pumpkins. (1) Plastic Bunting that measures approximately 30' wide that have ghosts, spiders, bats and pumpkins. (2) Ghost Window Decorations that measure approximately 65" high. 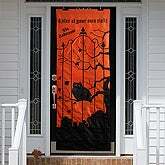 (1) Door Decoration that measures approximately 65" high that has a bat, spider and pumpkin and says "Happy Halloween". (8) Hanging Ghosts that measure approximately 12" high. Don't forget the Sticky Tack (sold separately) for easy installation. Please Note: Package includes banner, bunting, hanging ghosts and window and door decorations only. Does not include house, plants, tree or fence. • Overall Dimensions: 4.8 X 12.2 X 9.4 "
• Overall Dimensions: 4.8 X 12.2 X 9.4"
Halloween Pumpkin Garden Stake Did it work? Did it? Did it? Well, darn. He tried his best, but were very much afraid that our Halloween pumpkin garden stake is more of an attraction for friends and neighbors, than it is a deterrent as a scarecrow. A fabulous fun figure that makes a great piece of seasonal outdoor décor. Just move him out front where the guys and ghouls can appreciate the humorous character wearing a witchs hat and carrying a cat-tipped wand. Hand-painted metal. 11 x 32 x 6.5 inches. Halloween Witch Garden Statue Listen carefully and amongst the crackle of fall leaves you just might hear the cackle of something else! It's our witch garden decor, zooming in and dismounting from her broom to take up a position in your yard where she'll get the most attention from trick or treaters, and everyone else who passes by. A fun character decoration all togged out in orange and black for the occasion, with a pail of her own for a little trick or treating. She'll fit right into a group with our skeleton and scarecrow. Painted metal. Bottom stakes allow easy placement in the ground. Metal base included for displaying on flat surfaces. 11 x 34 inches. Halloween Surprise Windsock This windsock features a black cat jumping out of a pumpkin - a great addition to any halloween decor! Wonderfully detailed and made of nylon for long life. Applique. 12 Inches x 36 Inches. Halloween Outdoor Banner Its your basic black and white, but isnt that what makes it so spooktacular? We have a striking Halloween outdoor banner to trail a little terror among your trick or treaters this year. A great decoration to string along a porch eave or between posts and trees. Alternating ghost and black cats add that little bit of bump in the night thrills to the ambience around your yard! Nylon, heavy nylon cording. 10 ft. long. Halloween Pumpkin Windsock A cute black cat pokes out from a pumpkin on this decorative windsock. Great to hang outside during halloween or even during the entire fall season. Beautifully made and will be something you enjoy for many years to come. Applique. 12 Inches x 36 Inches. • Overall Dimensions: 16" x 8" x 8 "
• Makes a Great Addition to Your Halloween Decorations! Folding Skull Fence 48 unfolded This Folding Skull Fence is made of plastic that has (6) skulls hanging of off a worn criss-crossed iron fence that is covered in spider webs and measures approximately 48" across x 28" high. Includes (4) metal lawn stakes for easy installation. Eyeball Light Up Lawn Stakes (4 count) feature an UL Listed Light String that measures approximately 9' long. Eyeball globes measure approximately 4.5"" high x 4.5"" wide. Eyeballs and stakes are made of plastic. Eyeballs change color and fade on and off. Includes 4 Eyeball Globes and 4 Plastic stakes. Stakes are approximately 5"" long. For indoor or outdoor use. Peeping Tree Hugger A wicked chap for your tree to wrap. This Peeping Tree Hugger is a clever yard decoration for your Halloween Bash. This ghoul is life size, made of vinyl and polyester, adjustable and the hands hook in the back. Glowing Outdoor Crashing Witch is made of plastic and is still holding on to her broom. Includes 5 pieces that light up and flash: both hands, the top of head and both feet. Spooky lighting slowly pulses on and off - creating an eerie effect. Also includes a plastic broom that is approximately 21"" long. UL Listed. Black AC Power cord measures approximately 8' from end of prop. Includes 4 extra bulbs. ecoration also includes 5 ground stakes. For indoor and outdoor use. Skull Fence Posts (2 Pack) Includes 2 plastic molded skull fence posts and an adjustable plastic chain. Each post is sculpted into a realistic skeletal form with a grimacing skull head. Each post measures approximately 33" tall. For indoor or outdoor use. Includes adjustable plastic chain (that comes in 4 sections that attach to each other). Some assembly required. Silver Skull Fence Silver Skull Fence measures approximately 33.5"" high x 38"" wide (both pieces connected) and is made of plastic. 3' Grey Cemetery Fence (2 pc) Includes 2 plastic fence sections, each approximately 30" high x 18" wide. Sections snap together. Fencing measures approximately 30" high x 36" wide with both sections assembled together. Light Up Gothic Skull Fence Each set includes 2 battery powered interlocking fences featuring skull heads with eyes that flash a red glow to beckon trick-or-treaters! No cords or electricity are required - 2 - "AA" batteries (not included) are all that is needed. Includes 2 fence pieces - each piece is approximately 12.25" high x 24.75" long. Skull Yard Decor Made of sturdy foam. Includes 2 plastic stakes for easy setup. Approx 30" tall x 17" wide. Sparkling Pumpkin Porch Light Cover A festive decoration that will put a grin on any monster's face! Package includes one (1) sparkling pumpkin porch light cover. Measures approximately 12.25". • height 30" x width 18 "
Outdoor Wanted Posters Let your neighbors know which ghouls are on the loose with our Outdoor Wanted Posters. Posters of notorious villains include The Invisible Man, Werewolf, Zombie, Monster, Dracula, and the Wicked Witch (all shown). Each cardboard-backed poster is wrapped in plastic, so they're safe to hang outside. Know "witch" way the wind is blowing! Halloween Forest Faces Turn Your Yard Into A Haunted Forest Amuse your guests with this scary Black Cat and ghoulishly green Witch. They hang in minutes on any tree using nails or screws. Durable, hand-painted cast resin. Mysteria Wizard Have you ever had the pleasure of visiting an enchanted forest? Make one! - It takes but one tree to enchant an entire woodland or garden. Hang one of these fanciful faces on your favorite tree (or trees) and delight to the sight of the friendly sprite who emerges.Made of weather-resistant resin, and kind to trees - a nail that goes no farther than the bark will hold the hands nicely. Size Gazing Ball 4"-diam. Tree Sprites Have you ever had the pleasure of visiting an enchanted forest? Make one! - It takes but one tree to enchant an entire woodland or garden. Hang one of these fanciful faces on your favorite tree (or trees) and delight to the sight of the friendly sprite who emerges. Just for fun, choose pointy-eared Pinewood Elf, Mysteria Wizard or full of folly Jolly Holly. All are made of weather-resistant resin, and are kind to trees - a nail that goes no farther than the bark will hold the sprites nicely. Mystic Gazing Ball Made of weather-resistant resin, and kind to trees - a nail that goes no farther than the bark will hold the hands nicely. Size Gazing Ball 4"-diam. Gold Lawn Stakes (3 count) Gold Lawn Stakes (3 count) have 2 gold tone brushed with black skulls made of plastic with a plastic black chain. Stakes are interlocking. Lawn decorations are weather resistant. Stakes measure approximately 21" high x 7.5" wide. Enter If You Scare Yard Sign Halloween Lawn Sign that is approximately 15" high x 16" wide and says "Enter if you Scare!'" Grim Reaper Ghoulish Grabber Watch out for this grim ghoul. The Grim Reaper Ghoulish Grabber is a giant plastic decoration for indoor or outdoor use. The head measures approximately 5' tall. Mummy Ghoulish Grabber The Mummy is among us! This Ghoulish Grabber by Create-A Scene™ has a glowing-eyed Mummy head with wrapped hands that are ready to grab you. Head measures approximately 5' tall. Decoration is made of plastic for indoor or outdoor use! Witch Ghoulish Grabber (3 count) Don't let this gruesome witch grab you! The Witch Ghoulish Grabber is made of plastic for indoor or outdoor use. Her head measures approximately 5' tall and includes 2 green hands. Skeleton Ghoulish Grabber Don't let it grab you! This plastic Skeleton grabber comes three (3) pieces to a pack, can be used in many areas and is perfect for indoor/outdoor use! The head measures approximately 5 feet tall and is a spooky addition to your Halloween decorating! Color Change Garden Rock - Beware! Beware of this rock. The Color Change Garden Rock  Beware! Is a great decoration for your yard or porch. The "Beware!" message shines brightly as it changes color. The rock takes two (2) AA batteries (included). Pair it with the Color Change Garden Rock  Stay Out! (sold separately) for a great complement. Skull Light Up Lawn Stakes (3 count) Package includes 3 Skulls that light up and flash on and off. Runs on 2 - "AA" batteries (not included). Measures approximately 17" high x 25" wide when assembled. Package includes 3 Light Up Skull Heads, 3 - 4.5" Poles, 3 - 8" Stakes, 3 - 13.5" plastic chains and 1 Battery Pack. Power cord measures approximately 24" long. Bats Light Up Lawn Stakes (3 count) run on 2 - "AA" batteries (not included). Measures approximately 17" high x 25" wide when assembled. Package includes 3 Light Up Plastic Bats that blink on and off, 3 - 4.5" Poles, 3 - 8" Stakes, 3 - 13.5" plastic chains and 1 Battery Pack. Power cord measures approximately 24" long.